I’m reviewing another pair of DC Direct Busts this evening, and these run the gamut from one of my favourite pieces of all time to one I could really take or leave. It’s time to have a look at the DC Direct “Villains” of the DC Universe Etrigan the Demon and Sinestro Mini-Busts. The Demon Etrigan is a fascinating Jack Kirby creation who been around since the early ‘70s and has had a recent resurgence in popularity thanks in part to appearances in the Justice League Unlimited cartoon. He had the grand distinction of being made as a 6” figure in the very wave of Mattel’s DC Universe Classics, and now he’s made it into the statue realm, tagged under the “Villains” of the DCU banner. The labelling here is debateable, considering that Etrigan has also been a JLA member. Perhaps they were struggling to fill their “villain” quota…. Thankfully the label has no impact on the quality of the bust itself. This piece is not only by far and away the best in Gary Frank’s version of this series, it’s currently one of my favourite busts, full stop. Sculptor Jean St John has done an amazing job of translating Frank’s Jason Blood design to three dimensions. This is truly a sensational piece. Everything about this design and sculpt works. 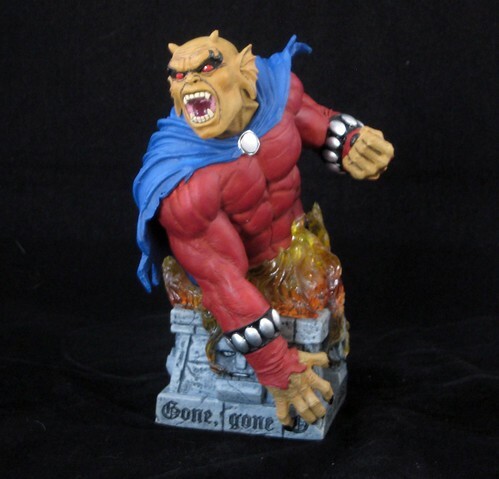 The menacing, truly Etrigan-ish headsculpt, the powerful, tortured pose and Etrigan’s tattered cape are all perfect This is complimented by a spotless paint job, excellent colour choices and the great use of different textures. I really can’t imagine how this bust could have been improved! I’m always a fan of a bust with a base that relates to the character, and this piece definitely delivers. As well as having Etrigan emerging from the base amidst translucent flames, the bottom edges of the base are inscribed with the end of the poem that summons the demon himself: “Gone, gone the form of man, rise the demon Etrigan”. Very clever stuff. Now that Etrigan’s been such a success in bust form, I hope it’s only a matter of time before he sees a full-sized release. It’s these oddball characters appearing in a line that really excite me, and I’d love to see DCD do more of it! So that leaves no guessing as to which bust I’m in love with and which one I’m not so wild about. On the lower end of my scale the Sinestro Villains of the DCU Mini-Bust. There are three reasons this piece doesn’t work for me, and I don’t think it’s just that I’m suffering from Sinestro overexposure. I love what Geoff Johns has done for the archenemy of the Green Lanterns, including the new costume. It makes sense that the master of yellow energy should have that reflected in his costume, and I’m surprised no one thought of it earlier. The first issue is the colour DCD continually chooses for Sinestro’s skin. There’s something too “grape” about it. There’s too much purple and not enough red to achieve a true Sinestro tone. It’s a big turn-off for me. 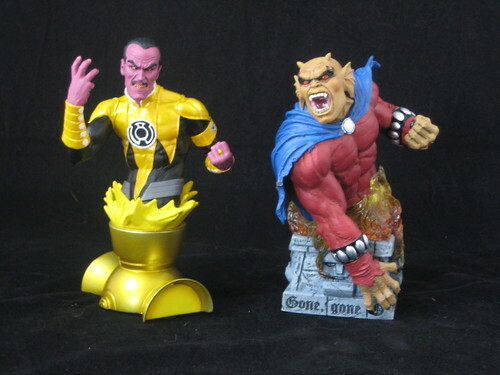 The second concern is the weird twisting ab-crunch Sinestro is doing in this pose. As well as making him look impossibly thin-waisted in side view, it makes him slightly hunched over, and it doesn’t look like a powerful pose. Not sure if this is more an issue with Gary Frank’s design or the sculpt, but it keeps the piece from realising its potential as a powerful representation of one of the DCU’s main baddies. The final strike against this piece is the base. 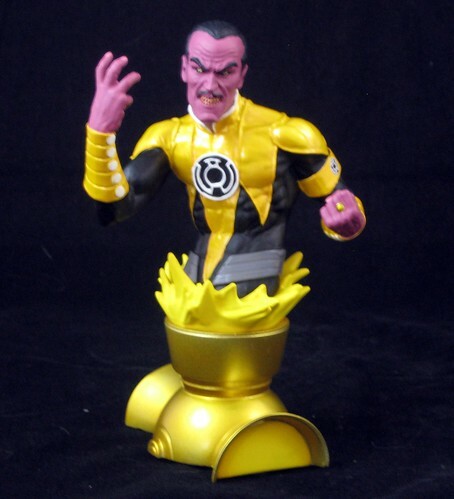 It’s either a repainted version of the Hal Jordan bust base from the first wave of this series, or designed to match, and it has the same issue – the energy blasts the bust is emerging from really need to be translucent to work, but instead they’re painted yellow, so it looks like Sinestro has just jumped into a vat of mustard. That’s not a good thing in the world of super-villainy. So it’s a mixed bag from DCD this time around. My great enjoyment of the Etrigan bust far outweighs the disappointments with Sinestro, and overall DCD continues a very strong track record with its bust and statue output. The Heroes / Villains of the DCU bust line is being overtaken by Blackest Night for awhile, so I’ll be having a break, but I’ll be back from the Hawk and Dove pieces later in the year! Man those are fantastic looking. Hmmm.....I don't mind Sinestro. Agree about the mustard vat tho'. Weird! I hadn't noticed the vat of mustard perspective, but now that it's been pointed out to me it's something I can never unsee. Too bad, it looked like a good bust. Etrigan does look quite awesome. If I ever get all the Womens busts I will start in on getting the Heroes and Villains busts, and Etrigan would be one of the first ones I want. I really dig his appearance back in Batman The Animated Series.